What’s the second most important market data after price? Joseph Granville recognized how important volume is for confirming trends and created the on-balance volume indicator. Joseph Granville’s track record was controversial but his influence of the stock market was extraordinary for a technical analyst. There was a time when Joseph Granville could send the market plummeting by issuing a bearish outlook. Read this Bloomberg article on him. The value of on-balance volume is irrelevant as it depends on when you started calculating the indicator. Its direction is the key to effective analysis. Most of the time, the on-balance volume matches price movement. When they diverge, look out for opportunities to fade ‘dumb money’ that does not have the support of volume. 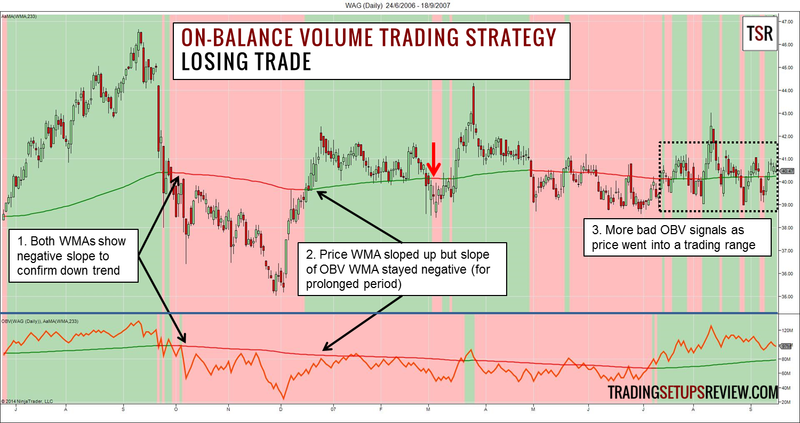 The slope of the price WMA turned negative (note red background), but the slope of OBV WMA stayed positive. It showed that the price pullback did not have the support of volume. The ‘dumb money’ was pushing their luck. Once the price WMA slope reverted to positive, we bought into a strong bullish move. Price rose up sharply and turned the WMA slope positive. 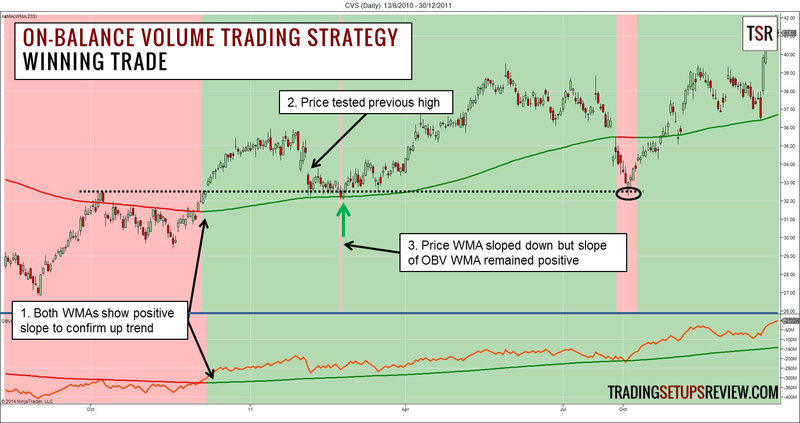 The slope of the OBV WMA stayed negative and implied that ‘smart money’ did not take part in that upwards swing. Following the trading rules, we shorted at the red arrow as the WMA turned down. However, price moved against us with another strong bullish move. 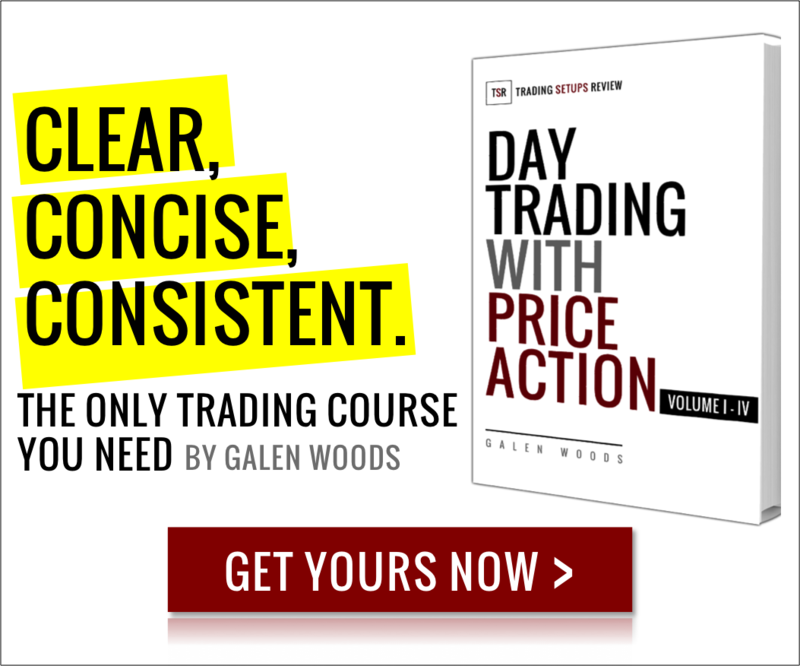 Learn more about this classic volume indicator with Joseph Granville’s New Key to Stock Market Profits . for short intraday use 5 min timeframe with 15WMA.